On a day when Americans across the nation celebrate the work and sacrifices of military service members, dozens of veterans chose to protest for medical marijuana access by dumping prescription pill bottles at the White House. While progress is being made federally for veterans’ access to medical cannabis, advances are moving too slowly for too many veterans. The occurrence of suicides and prescription pill addiction rates for military veterans are a national tragedy and embarrassment. The veterans and protesters — affiliated with various veteran and marijuana advocacy organizations — argued that Veterans Affairs hospitals are over-medicating veterans, prescribing them a large number of psychoactive medications to treat PTSD. They marched from McPherson Square to the Department of Veterans Affairs headquarters, then to the White House, some smoking joints along the way, which is illegal in D.C.
VA health-care providers can’t talk to their patients about medical marijuana options, even in states where there are legal medical marijuana programs. A bill in Congress, the Veterans Equal Access Amendment, would allow doctors to provide recommendations about participating in such state programs. “There’s something seriously wrong going on. It’s disgusting,” said Jose Martinez, 27, a triple amputee who stepped on a bomb while serving in Afghanistan in 2012. Martinez, who lives in California and works with the Weed for Warriors Project, said he was prescribed a cocktail of pills and had a debilitating pain pill addiction. According to the 2008 Department of Defense (DoD) Survey of Health Related Behaviors among Active Duty Military Personnel, just 2.3 percent of military personnel were past-month users of an illicit drug, compared with 12 percent of civilians. Among those age 18­–25 (who are most likely to use drugs), the rate among military personnel was 3.9 percent, compared with 17.2 percent among civilians. However, in spite of the low level of illicit drug use, abuse of prescription drugs is higher among service members than among civilians and is on the increase. In 2008, 11 percent of service members reported misusing prescription drugs, up from 2 percent in 2002 and 4 percent in 2005. 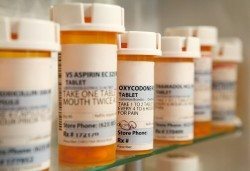 Most of the prescription drugs misused by service members are opioid pain medications. The greater availability of these medications and increases in prescriptions for them may contribute to their growing misuse by service members. Pain reliever prescriptions written by military physicians quadrupled between 2001 and 2009—to almost 3.8 million. Combat-related injuries and the strains from carrying heavy equipment during multiple deployments likely play a role in this trend. It is simply a disgrace that politicians, policy makers, and frankly, everyday citizens claim to support the troops, but then don’t support their ability to utilize a medicine under the advisement of their doctor that can help alleviate their pain and suffering. As the protesters symbolic protest notes, doctors are pushing pills upon service members, with potentially fatal consequences, when there is a much safer option that can help prevent addiction and, potentially, even suicides. It was great that the Senate passed an amendment allowing VA doctors to recommend medical cannabis in states where the substance is legal, but that doesn’t go far enough for our military veterans, or for anyone in this country. Those that sacrifice for our freedom, regardless of the state they may reside in should be able to utilize medical cannabis legally.